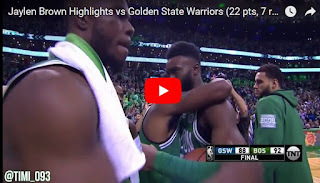 Jaylen Brown got 22 points to go with seven rebounds, two blocks and two steals as the Celtics came back from 17 points behind and beat the Warriors for their 14th win in a row. Brown played probably his best game in career and dedicated the win for his close friend who passed on Wednesday. Al Horford added 18 points and 11 rebounds on the night and Kyrie Irving ditched the mask and hit some clutch free throws, finishing the game with 16 points, five rebounds and six assists. Jayson Tatum and Marcus Morris both scored 12 points but it was Celtics defense that really played the key role in that comeback win. Boston held the Warriors to just 88 points and that's somethinf that does not happen often. 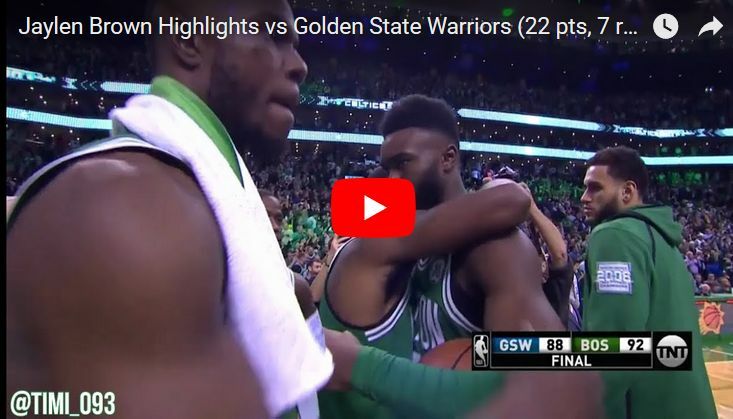 Celtics used their 19-0 run from the third quarter to make the comeback and played some great defense down the stretch against one of the best teams in the NBA history, making sure Jaylen Brown will get the win for his late friend.